7", 2006, A cat unlike any other. 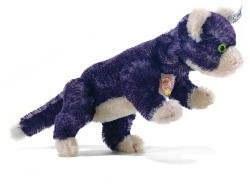 Besides her dazzling and unusual purple color, stuffed with genuine Swiss wood shavings, hand blown green glass eyes. Kitty has a secret-- her head rotates 360 degrees when you gently twist her tail. This tabby is an exact replica of a 1931 original, making her the first black and white tag limited edition in North America. Only jointed at the legs.